We have three Christmas trees. Yes, three. In my defense, there is an important reason for all of these trees and each one holds a great significance to me. This is the first tree. It is a little smaller than the others and stands in a gold urn. This tree is special because it is decorated in my honey's grandma's ornaments. Yes...they are antiques. She was going to donate them to Goodwill about 15 years ago and offered them to us...we love them. or "Silent Night, Holy Night". We also added blue poinsettias and icicles. 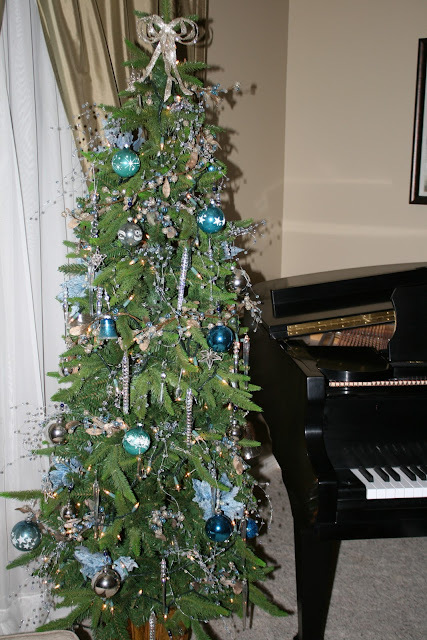 This is our "formal tree" and sits in our front room. I also put this in our front room too. I love it. It totally calms me when I get a little stressed about the holiday. It brings me back to the reason for the season. 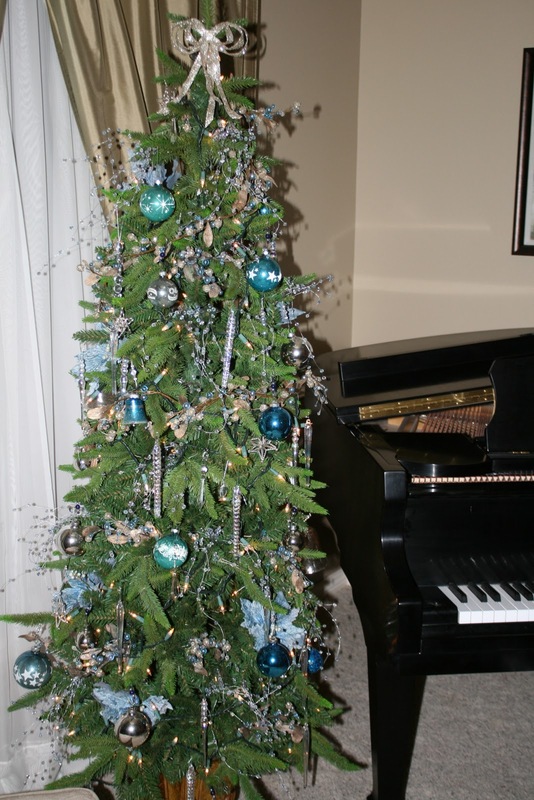 This is the tree in our family room. It has ornaments that David and I got when we were first married. It has berries, bows, pine cones, birds and birdhouses. The tradition on this tree is to add a photo of our kids each year. This is Nate. The kids love to look at their pictures throughout the years. Morgan and her beautiful smile. This is this years photo nestled in the branches with the pine cones. and maybe even the pooch. ice skate from the 2002 Olympics in Salt Lake City, Utah. and our visit to New Orleans. This is our Disneyland ornament. And the one we got while in New York. This one is from visiting Thomas Jefferson's home Monticello. 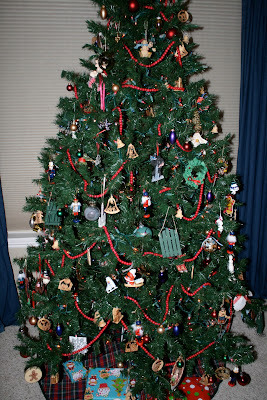 We collect ornaments throughout the year and put them on our tree each Christmas. 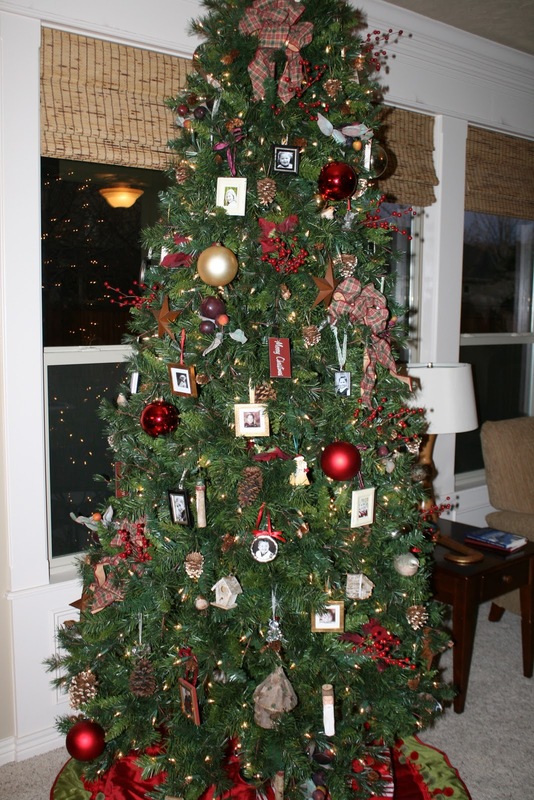 What are your Christmas traditions? 2 Response to "Christmas Trees"
Thanks for the festival of trees tour. I haven't seen your beautiful home decked out for the holidays, yet.... it's very festive and fun! I have a bunch of antique ornaments as well from my grandma. She was going to donate them too! Most were in their original boxes and are soooo cool..